It folds down to give you a perfect night’s sleep. Then it folds up to create a larger living area, perfect for entertaining or just having to yourself. A wall bed is a modern and stylish way to create more space in your home while ensuring your sleeping hours are as comfortable as possible. With space at a premium in many Australian homes, people are looking for new ways to enhance their lifestyles and a Wall bed is a cost effective solution. Why renovate or move to get more room when you can simply fold your bed away and get the space you’re after? Any room can become a bedroom with a wall bed. The biggest change you’ll notice with a wall bed is extra space. Wall Beds Brisbane install compact wall beds that fold away during the day, either to an inset wall space or to a cabinet complete with shelves for storage and display. This creates a stylish feature for the room, creating a hidden bed while enhancing the look and feel of the room. And when it comes time to sleep, the wall bed folds down quickly and easily, transforming the space into a bedroom perfect for relaxing. When you wake up, just fold it away – covers and all – and turn the bedroom back into whatever you want it to be. Wall beds are also a great solution if you have guests coming over if you live in a place where space is limited or you want the use of an extra room. A wall bed can unlock a new lifestyle, integrating easily into wardrobes, media centres and home offices. Wall Beds Brisbane makes its wall beds to the highest standards, ensuring they are strong, safe and secure. 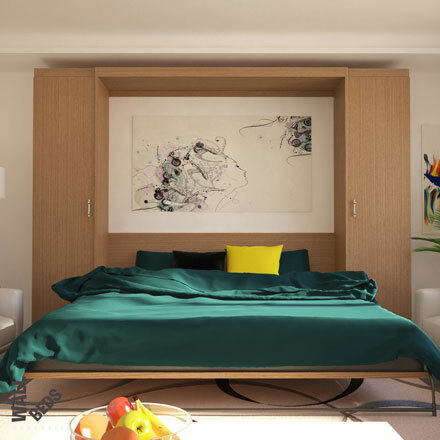 With the Murphy Bed Systems Alpha bed able to be installed both vertically and horizontally, it is one of the most versatile and creative by design wall beds on the market today. 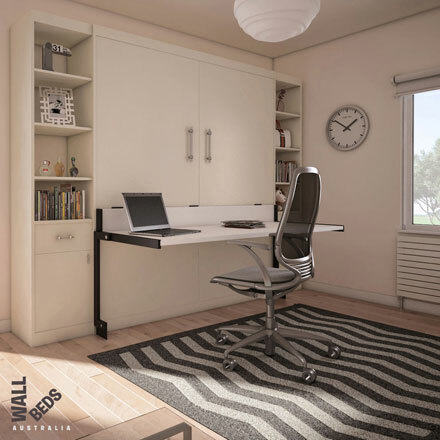 We can even supply a studio desk that attaches the front of your Alpha wall bed to create the perfect home office. 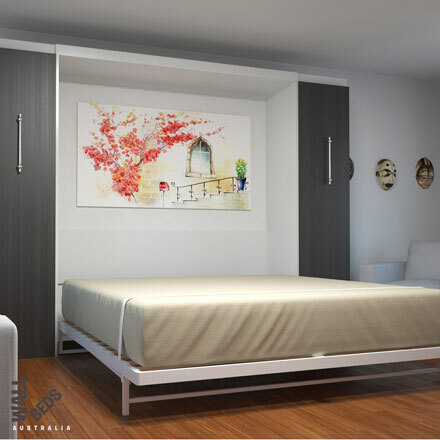 The Murphy Wall Bed Systems wall beds use sturdy, reliable hinges, counterbalance systems and frames. The system is so easy to use that with the correct supervision even kids can handle it! Wall Beds Brisbane have seen how popular these have become over the years and our products never fail to impress – especially when people have guests over! Simply call us on 1300 442 771 and we can run you through our huge range of wall beds that can bring a new dimension to your home. Quick & easy to assemble. 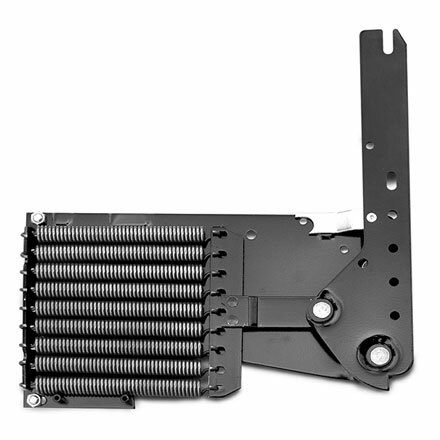 Can be mounted free of any cabintery. The Alpha Steel frame bed can be built vertically or horizontally. The Alpha Bed Studio Desk/Table for your home office or study. Create your own Wallbed of any size vertically or horizontally.